What makes Rochester a prison town? The Rochester Decarceration Research Initiative was formed to pursue this question. 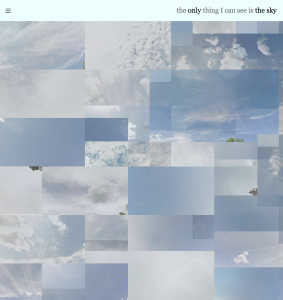 I am working with Evelyne Leblanc-Roberge, Associate Professor of Art at UR, on a public art installation entitled “The only thing I can see is the sky.” As Evelyne’s research assistant and collaborator, I am creating a digital/analog campaign that provides viewers of the installation with more information on the project, the artists, and the wider research initiative. In the Fall of 2017, I taught a 4-credit undergraduate class entitled “What does a feminist look like? 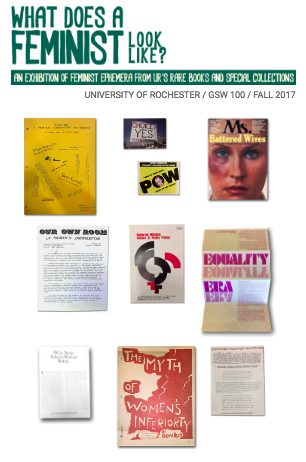 Art and Activism in the Second Wave.” As a final project, students worked with materials in the University of Rochester’s Rare Books and Special Collections Library that related directly to the class’s content and timeframe. Using WordPress, each student connected his or her selected object with artworks, publications, primary documents, and current events as a way of constructing a network of interpretation around the object. 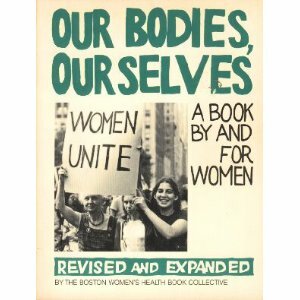 The design of the main page for the exhibition was inspired by Printed Matter Tables, and the header image is a riff on the cover of Our Bodies, Ourselves.